Keep an unbiased record of what was displayed on your video wall or control room display, or capture and stream the video wall or parts of it to remote viewers. Epiphan’s standalone and networked VGA Grid products are ideal for the task. The model chosen is based on the number of video display sources, and the number of control rooms or display walls you want to record. A VGA Grid system captures, encodes, records and streams between one and 64 video wall sources. Each of the sources can be mapped to one or more independent output channels for recording and streaming. Output channels can be also be combinations of one or more input sources arranged in a custom layout. An included all-in-one recorder lets you record all the channels simultaneously to one multi-track file for archival purposes. 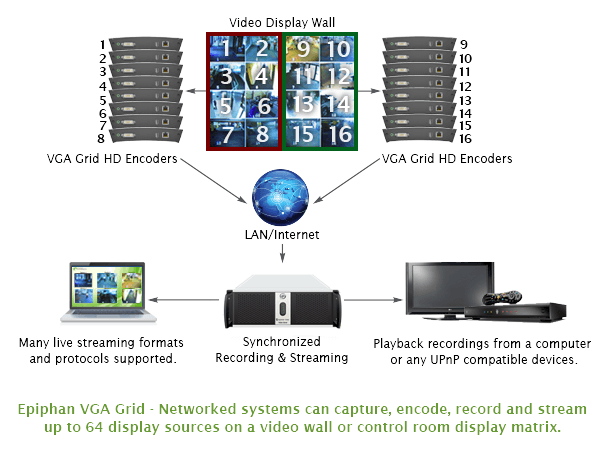 The VGA Grid system applicable to your case depends on the number of video sources to capture. For small systems with 6 or fewer sources, the standalone VGA Grid is ideal. For larger video walls or distributed sources, the networked VGA Grid offers the necessary flexibility. The Standalone VGA Grid system can capture, encode, record and stream up to 6 display sources on a video wall or control room display matrix. Resolutions up to 2048×2048 are supported, and all six channels can be streamed at 30 fps. To start capturing and recording the video wall, simply connect the VGA, HDMI™ or DVI output port from the video wall displays to the VGA Grid. If the video wall displays don’t have an output port, we suggest using an inline splitter to split the signal to both the VGA Grid and the displays. The Networked VGA Grid system captures, encodes, records and streams up to 64 display sources on a video wall or control room display matrix. Resolutions up to 1920×1080 are supported, and each of the 64 channels can be streamed at 30 fps. To start capturing and recording the video wall, simply connect the VGA, HDMI or DVI output port from the video wall displays to individual VGA Grid HD encoders. Configure the Networked VGA Grid to receive the encoded data over your network. From there you can synchronize, record, and stream the data. If the video wall displays don’t have an output port, we suggest using an inline splitter to split the signal to both the HD Encoders and the displays. The Networked VGA Grid takes the remote control room video wall recording to next level by capturing, recording and streaming multiple remote video wall sources. Each of these sources can be streamed and recorded individually. VGA Grid also has the ability to create multiple output channels, where each channel can be any picture in picture matrix combination of the video sources. Each channel can be shared as independent video streams URL viewed live between control rooms. VGA Grid HD Encoders are centrally managed and synchronize on a common clock source to provide a complete view of the mission or incident – synchronized in time.